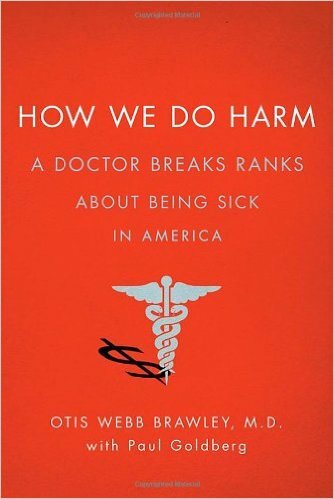 How We Do Harm: A Doctor Breaks Ranks About Being Sick in America, in my opinion, should be on everyone’s to-read list. Dr. Brawley does an excellent job of showing how American medicine, with profit as the bottom line (propped up by insurance companies, Big Pharma, and often-faulty research that is manipulated to making fear the driving factor for patients), does more harm than good in most cases under the pretense of providing “health” care. Dr. Brawley’s caution, cynicism, and rational, analytical, reality-based approach to practicing medicine (he is an oncologist on staff at Emery University and works at Grady Hospital, the low-to-no-income hospital in Atlanta) is, sadly, the exception rather than the norm in the medical profession. But as Dr. Brawley eloquently and factually lays out how the United States’ health care system works and why he eschews it in favor of his patients (many of whom are not indigent and end up in his care after being harmed – eventually, fatally – by traditional American medicine practices), there is a sense of outrage at the lies and harm, because of greed, that Americans are told and suffer. Like Dr. Brawley, I personally do not see our present medical system disappearing or even being slowed down by books like this. We the people are too sucked in to the web of deceit, over time, to accept that people who supposedly have our best interests at heart actually don’t care about us, but instead see us profit-generator. But, also like Dr. Brawley, I continue to beat the same drum he does in this book, with this blog providing education and practical information on everything related to dementia (types, care, medications, myths, fallacies, and deep research) and approaching this very personal-to-me topic with the same caution, cynicism, and rational, analytical, reality-based approach that Dr. Brawley practices oncology with. We may be the only two people in this country who dare to speak truth with regard to medical practices and who are genuinely concerned for and care about the people involved more than anything else, but I’m glad to know that I am not all alone (Dr. Brawley discusses this as well), as it often can seem. Amen. I totally agree 100% with everything you said in this post. Money is the bottom line in what American health care is all about, and it will never change. Glad you found Dr. Brawley and you know you are not alone in your quest to make people wake up and see the truth. A friend and I were recently talking about how many people we know that doctors have managed to help die before their time. I use alternative ways to correct health problems – herbs, essential oils, foods. I do this rather than going to see a doctor. God bless you in your efforts to educate others. Thank you, as always, my friend, for your comments. Like you, I use diet, exercise, and basic supplementation to manage my health. I cook and bake everything from scratch – I have found that I really don’t care for restaurant food the very few times a year I might eat it – and eat healthily (no processed food, no junk food, no sodas, and little sugar except for desserts on occasion that I might make) and do everything within my power to stay healthy. Fortunately, I really enjoy cooking and baking, and because I eat to live instead of living to eat, I’m able to have a very healthy lifestyle. I agree, Bronte, that people around the world should read this book. I keep up with a lot of the healthcare news in the UK, and I agree that the NHS is in serious trouble just like the American health care system. Cheers!